Get ready to add that wow factor to your contemporary living space with this sophisticated TV stand finished in glossy white, featuring thick panelled fixed shelves to accommodate all your media components, and accented with 8mm clear tempered glass sides giving it that modern airy appeal. This style worthy TV stand can accommodate up to a 60"L flat screen television. Assembly is required. Create a European look to your living space with this contemporary dark taupe reclaimed-look TV console. The thick paneled frame paired with a tempered glass center sliding door, is supported by stylish sleek silver legs and 2 pre-drilled capped wire management holes in the back panels. Featuring 4 storage drawers and 2 adjustable center shelves, this TV stand will meet all your media storage needs in style. White Hollow-Core 60"L Tv Console With 4 Drawers Complete your home dicor with the simple contemporary elegance of this bright white TV console. Featuring 4 spacious storage drawers for your entertainment accessories and 2 open storage shelves for your electronic components, this piece is the perfect blend of fashion and functionality. Sleek track metal legs and silver coloured drawer handles provide a modern look that makes this console a must have in any home. 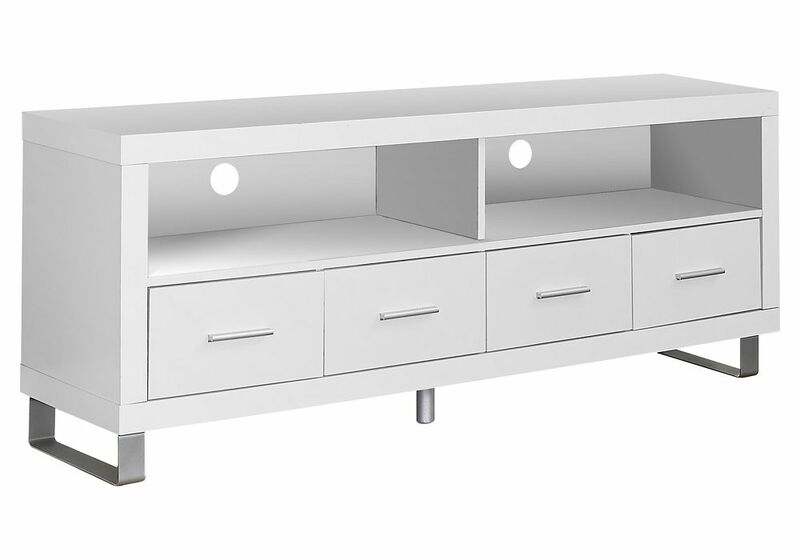 White Hollow-Core 60"L Tv Console With 4 Drawers is rated 5.0 out of 5 by 1. Rated 5 out of 5 by SDguy from Nice sturdy unit. Highly recommended. It's in between a gloss and matte white. Nice sturdy unit. Highly recommended. It's in between a gloss and matte white.